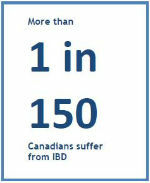 Did you know that Canada has some of the highest rates of inflammatory bowel disease (IBD) in the world? According to the Crohn’s and Colitis Foundation, young people are the fastest growing group being diagnosed with IBD. At Mount Sinai Hospital, we’re tackling this issue head on, which is why we created the Centre for Inflammatory Bowel Disease, one of the Hospital’s six centres of excellence. The Centre is also the tertiary referral centre for all of Ontario for patients with complex IBD for second opinion and/or ongoing longitudinal care. By bringing together Canada’s largest, most comprehensive team of IBD clinicians including gastroenterologists, colorectal surgeons, nurses, allied health, enterostomal therapists, investigators and research staff, we’ve got some of the brightest minds improving patient care, training our future clinicians and discovering cutting-edge breakthroughs.